The data cap issue with Apple's 4G LTE iPad was characterized in a piece by The Wall Street Journal on Wednesday as a "speed trap" that can catch users off-guard. The story featured one user who streamed just two hours of March Madness college basketball before he burned through his entire two-gigabyte monthly data allotment. The Verizon customer's $30-per-month data plan with his new iPad offered great video quality over the high-speed 4G LTE network. But that higher video quality also led to him reaching his data cap faster than expected, requiring him to pay $10 for every extra gigabyte he uses over the montly limit. "It has been only five days since users of Apple Inc.'s newest iPad first took the device out of the box," author Anton Troianovski wrote. "Some are now finding just how quickly the promise of superfast wireless connections collides with what the reality of those services cost." In the U.S., mobile data plans are capped at the two largest carriers: Verizon and AT&T. 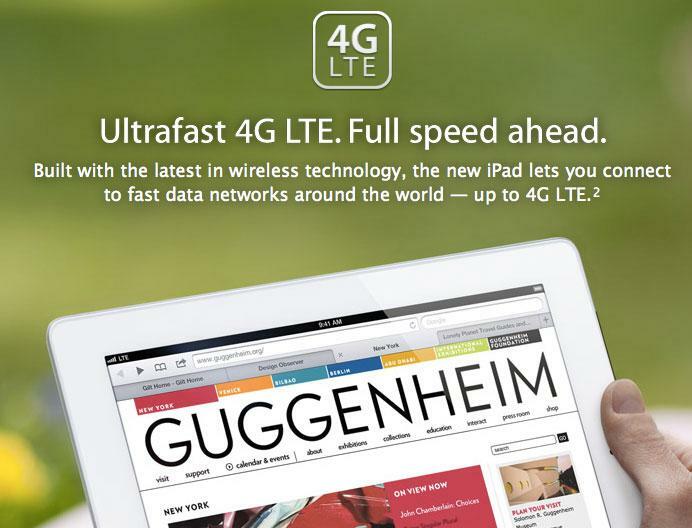 Those are the same two carriers with 4G LTE networks compatible with Apple's new iPad. AT&T began capping iPhone and iPad data plans in 2010, while Verizon followed suit last year. Sprint is the only major carrier in the U.S. without a data cap, but it does not offer a 4G LTE network, and Apple does not sell a version of its new iPad compatible with Sprint's network. The combination of data caps and high-speed LTE devices was characterized as a "quandary for wireless carriers" by the Journal, which noted that carriers are "banking on mobile video" to push users to 4G-capable tablets, smartphones and other devices. "The carriers, suffering from a decline in voice-calling revenues, hope that LTE boosts monthly bills for wireless service, and they charge by the amount of data consumed," the report said. But streaming a high-definition video over 4G LTE to a new, Retina display-equipped iPad uses about 2 gigabytes of data per hour, Verizon said. Verizon's entry-level data plan offers two gigabytes for $30 per month.